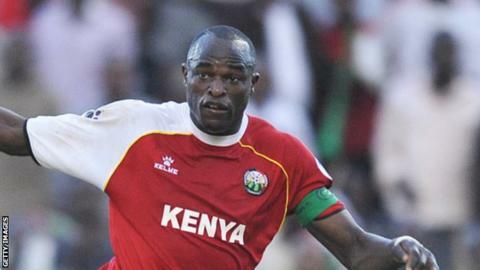 Dennis Oliech is Kenya's all-time leading goalscorer with 34 international goals. Kenya coach Sebastien Migne says he has not "shut the door" on Harambee Stars' all-time record goal-scorer and former captain Dennis Oliech, despite leaving the in-form forward out of their latest home-based, provisional squad. The 34-year old retired from international football in 2016, but is ready to play for Kenya again after joining Kenyan champions Gor Mahia last month. He has scored four goals in all competitions so far for Gor, including against Egyptian giants Zamalek in the African Confederation Cup. Despite his good form, Kenya coach Migne has left Oliech out of Kenya's 25-man party for their upcoming Africa Cup of Nations and CHAN (African Nations Championship) qualifiers against Ghana and Burundi respectively. "Many have been asking why Oliech was not summoned for the CHAN and Afcon [Africa Cup of Nations] preparations but I could not take risks as he was injured for the last 15 days," Migne told local media. "I have also watched him for some time and I think he has to improve in front of goal. "It's not a matter of scoring penalties. But that doesn't mean we have slammed the door on him. He is welcome to the team as he is an experienced player. If I need him before Afcon, I will discuss with him for a possible return but not as the team captain," Kenya's French coach added. Oliech, a former Nantes player, had been without a club since leaving Dubai CSC in 2015, before his move to Gor Mahia. He was part of the Kenya team at their last Africa Cup of Nations in Tunisia in 2004, scoring a goal in their 3-0 win against Burkina Faso in the group stage. He has made a total of 72 appearances for the Harambee Stars, scoring 34 goals to become Kenya's all-time record goal-scorer. Oliech started his club career in Kenya with Mathare United before moving to Qatar in 2003 to join Al-Arabi. He left Al-Arabi two years later to move to France where he played for Nantes, Auxerre and Ajacio and later joined UAE side Dubai CSC.